In a pot, add almond milk, salt and vanilla. Bring almond milk to a boil, add quinoa, stir, and lower to a simmer. Let simmer for 15 minutes, until the quinoa has soaked up all the liquid. Remove from heat and let rest to absorb any leftover milk. Loosen with a fork and cool down. You can store any leftover quinoa for a couple of days in an air tight container in the fridge for another breakfast. 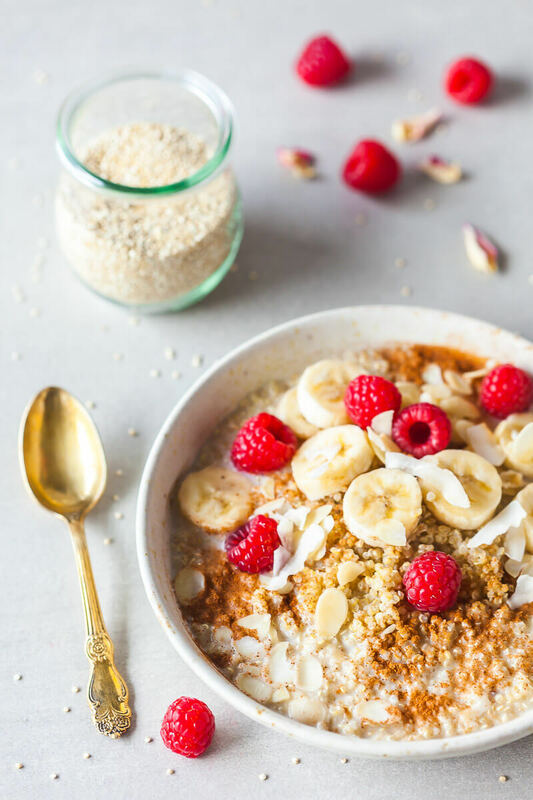 In a bowl, place 4 tbs cooked quinoa, add about a cup of almond milk (cold or warmed up), sprinkle with cinnamon, add banana slices, almond slices, coconut flakes and a couple of raspberries. Serve.